Son-in-law of Fawzi Barhoum, who himself worked in the Hamas TV propaganda station, reportedly killed by tank fire. The IDF continues to show that Hamas's terrorist leaders are not immune in the war they started on Israel, as the son-in-law of Hamas spokesperson Fawzi Barhoum was killed on Monday. 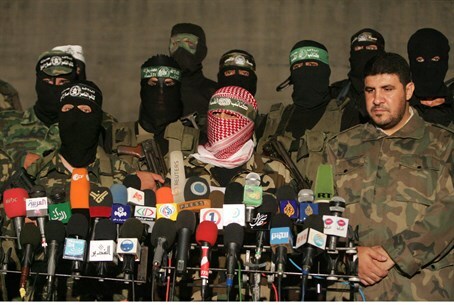 Abdullah Mortaja, the son-in-law of the Hamas leader, was killed in a strike by the IDF. Yedioth Aharonoth reported on his connection to Barhoum. The 27-year-old was a freelance journalist, who himself previously worked in the propaganda machine of the terrorist organization Hamas's Al-Aqsa TV station, according to AFP. The news source added that Hamas medical officials claimed Mortaja was hit by tank fire in the Sheijaya neighborhood in eastern Gaza City. Sheijaya was the scene of particularly intense fighting during Operation Protective Edge, and as revealed by the IDF has been completely commandeered by Hamas to embed rocket launchers and terror tunnels. Barhoum, Mortaja's father-in-law, last Sunday called for an escalation of terror attacks against Jews in eastern Jerusalem, Judea and Samaria as an "expression of support" for Gaza's terror war. The Hamas spokesperson added that if Israel did not submit to the terror group's extravagant demands it would be "an additional new act of foolishness and gambling that will bring more disasters on...the Israelis, beyond the decision for aggression and a ground war against Gaza." Reports on Monday indicated that an Egyptian proposed long-term ceasefire is waiting for Israeli approval, and may potentially go into effect over the course of Monday night. Hamas breached the last ceasefire last Tuesday, since then firing a total of over 650 rockets on Israeli civilian centers, 110 of which were shot down by the Iron Dome anti-missile defense system according to AFP. In the course of that rocket assault, four-year-old Daniel Tragerman hy''d was murdered by mortar fire in his Kibbutz Nahal Oz home last Friday. For its part the IDF has conducted over 350 airstrikes on Gaza since the breach, including numerous targeted attacks on Hamas leaders. Hamas's top financial chief and "Justice Minister," Mohammed al-Ghoul, was taken out by an Israeli airstrike on his car Sunday, after last Thursday three top commanders of Hamas's "military wing," the Al-Qassam Brigades, were taken out in a pre-dawn strike. Hamas military chief Mohammed Deif was targeted in a strike last Tuesday night, in which his wife and two of his children died. Hamas claim he survived what would be the fifth attempt on his life by Israel, but have not said anything about his condition. According to recent reports Sunday, Israel knew the location of the arch-terrorist Deif as many as three days ahead of the strike, but chose not to act on the rare opportunity to take him out due to the ceasefire.